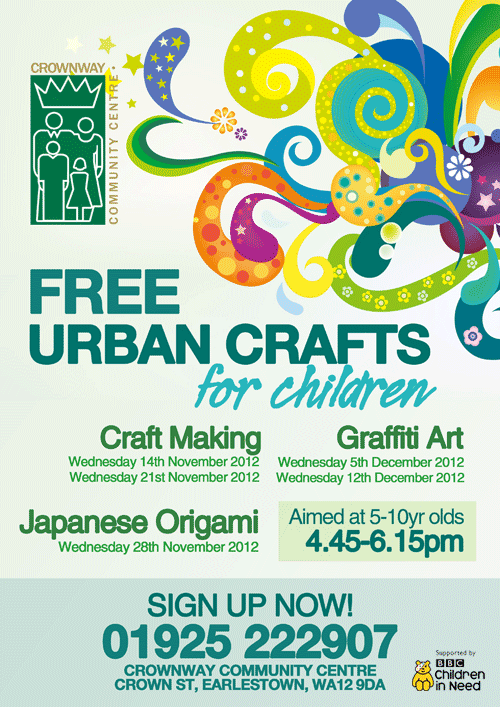 Crownway Community Centre in Earlestown will soon be offering five FREE sessions of Urban & World Crafts aimed at 5-10year olds. We held four of these activities over the summer and they were so well attended and popular that we want to offer them again. Our tutors – provided by Nugent Education Ltd., – are extremely talented and excel in making workshops fun, lively and educational. Everything that is made at the craft sessions can be taken home! To register your children, please contact us on 01925 222907! New and Exciting Ballet and Tap classes for children aged 5-7yrs are running every Thursday 4.00-4.45pm at Crownway Community Centre (£3.50 per child). Learn a new skill and make friends whilst having fun. Each year the children will take part in various shows and charity events and also work towards exams following the ISTD syllabus. Miss Alexandra Lewis (Aistd) on 07507 787 136 or email: alexandrajane240@hotmail.com. Alexandra also runs the Tiny Tutus pre-school ballet movements from 1.45pm – 2.30pm on Thursdays at a cost of £3.50 Please check the Whats On category above to find out more information.